Objective of the study: Laparoscopic mesh repair has become an increasingly common method for repairing incisional hernias. The current method for performing this repair includes tacking a mesh to the inner surface of the abdominal wall. The iMESH Tacker™ (IMT) is a device which simplifies the procedure by enabling an articulation of the device’s tip. The study compares the strength of mesh fixation between the IMT and another commercial tack device (ACT). Both tacks are absorbable. Description of the methods: strips of mesh were surgically installed on the inner surface of the abdominal wall in three commercial pigs. Half of them were fixated by IMT and half were fixated by ACT. Euthanasia was done immediately to the first pig, following 14 days to the second and after 27 days to the third pig. The abdominal was harvested and the mesh strips were pulled while fixation force was measured. Samples from both groups were sent for histo-pathological examination. Statistical analysis was done using the two tailed t-test. Results: All mesh strips were found to be fixated. At the two survived pigs, the meshes were covered by peritoneum. After euthanasia the strips were pulled and the detaching force was measured. The average force in the first pig was 17.1N±1.9 and 16.5N±8.3 (IMT and ACT respectively). The average force in the second pig was 18.8N±7.3 and 8.4N±4.1 (IMT and ACT respectively, p<0.05). The average force in the third pig was 16.3N±5.3 and 10.9N±5.9 (IMT and ACT respectively, p<0.05). Conclusions: The iMESH Tacker™ is both a feasible and easy to learn device for performing mesh fixation. The study showed that iMESH Tacker™ creates average fixation force which is higher than ACT. 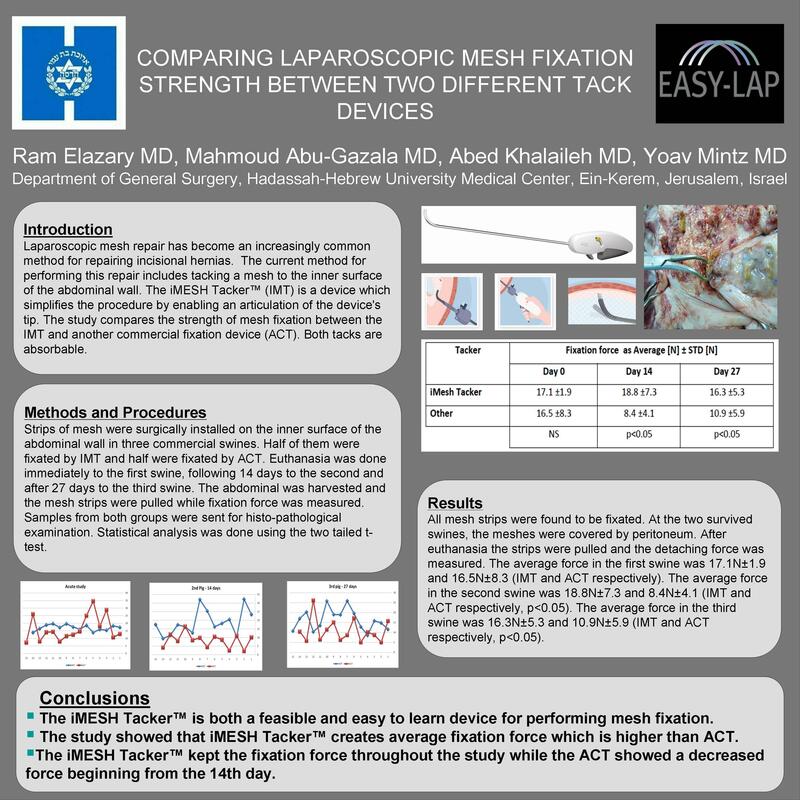 We have also showed that iMESH Tacker™ kept the fixation force throughout the study while the ACT showed a decreased force beginning from the 14th day.